Buy online AD595 Thermocouple Amplifier at low cost from DNA Technology in India. 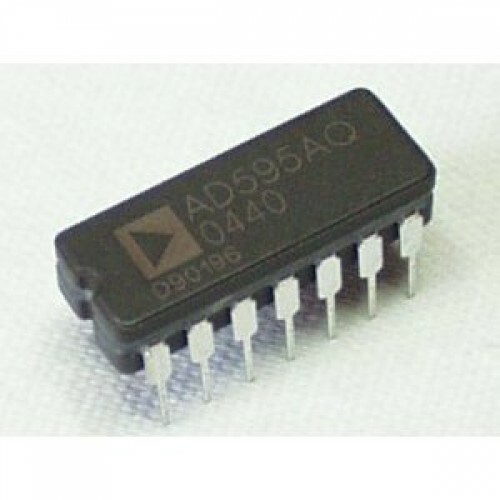 The AD594/AD595 is a complete instrumentation amplifier and thermocouple cold junction compensator on a monolithic chip. It combines an ice point reference with a precalibrated amplifier to produce a high level (10 mV/°C) output directly from a thermocouple signal. Pin-strapping options allow it to be used as a linear amplifier-compensator or as a switched output setpoint controller using either fixed or remote setpoint control. It can be used to amplify its compensation voltage directly, thereby converting it to a stand-alone Celsius transducer with a low impedance voltage output. The AD594/AD595 includes a thermocouple failure alarm that indicates if one or both thermocouple leads become open. The alarm output has a flexible format which includes TTL drive capability. The AD594/AD595 can be powered from a single ended supply (including +5 V) and by including a negative supply, temperatures below 0°C can be measured. To minimize self-heating, an unloaded AD594/AD595 will typically operate with a total supply current 160 µA, but is also capable of delivering in excess of ±5 mA to a load. The AD594 is precalibrated by laser wafer trimming to match the characteristic of type J (iron-constantan) thermocouples and the AD595 is laser trimmed for type K (chromel-alumel) inputs. The temperature transducer voltages and gain control resistors are available at the package pins so that the circuit can be recalibrated for the thermocouple types by the addition of two or three resistors. These terminals also allow more precise calibration for both thermocouple and thermometer applications. The AD594/AD595 is available in two performance grades. The C and the A versions have calibration accuracies of ±1°C and±3°C, respectively. Both are designed to be used from 0°C to +50°C, and are available in 14-pin, hermetically sealed, sidebrazed ceramic DIPs as well as low cost cerdip packages. 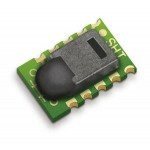 SHT15 Humidity & Temperature SensorThe SHT series offers a wide array of SMD relative humidity a..